Qualification : B.E. or B. Tech in Civil Engineering from recognized Institute/ University approved by the AICTE / UGC Candidates must have secured minimum 60% marks in the final Engineering Degree Examination. For SC & ST candidates minimum rnarks required is 50%. Reservation for SC/ST/OBC (MOBC) candidates will be as per existing Rules and Regulations of the Govt. of Assam. How to Apply : Candidates have to apply in prescribed application form as per Annexure-III. The date of receipt of application are from 31.05.2018 to 05.06.2018 up to 4.00 P.M. Short listed candidates on the basis of marks obtained in the final year of Degree Examination in Civil Engineering will be called for interview. 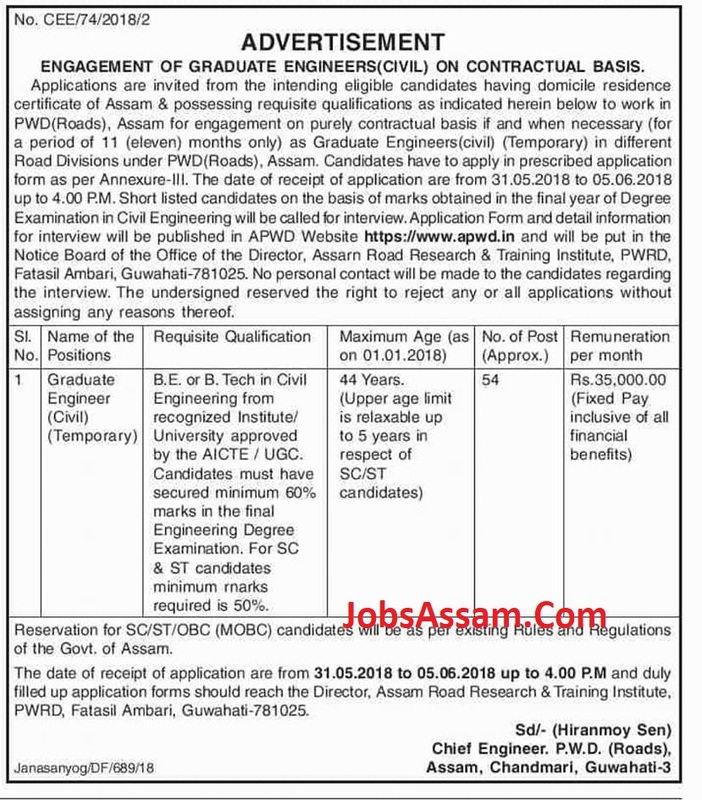 Application Form and detail information for interview will be published in APWD Website and will be put in the www.apwd.in Notice Board of the Office of the Director, Assarn Road Research & Training Institute, PWRD, Fatasil Ambari, Guwahati-781025. No personal contact will be made to the candidates regarding the interview. The undersigned reserved the right to reject any or all applications without assigning any reasons thereof.